The stonecrops, of which there are several species in Britain and Ireland, prefer dry soils and plenty of sunshine. 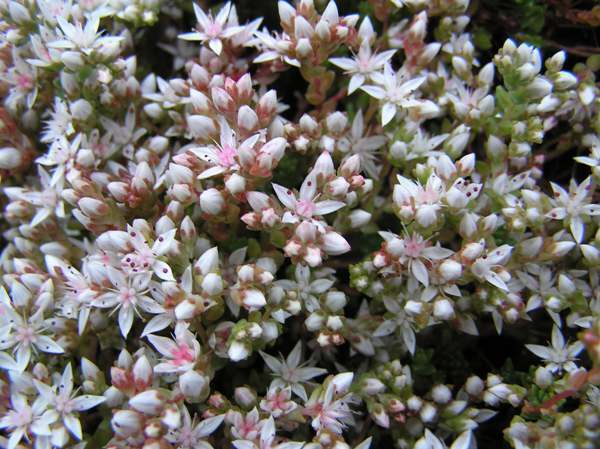 English Stonecrop is the most common of the whitish wild stonecrops found in Britain. With creeping, closely-packed flowering stems, English Stonecrop creates a dense mat up to 5cm tall. Fleshy oval greyish-green leaves alternate up the stems, taking on reddish tinges as the season progresses. 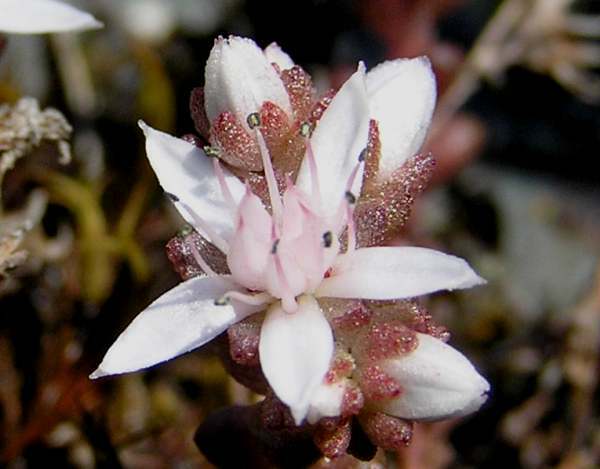 Flowers of English Stonecrop are star shaped with five pointed white petals tinged with pink; they are 11 to 12mm across. English Stonecrop is widespread and common throughout coastal regions of Britain and Ireland, but particularly so in the south and east. In coastal parts of mainland Europe from Norway down to Portugal you can see these pretty summer flowers. 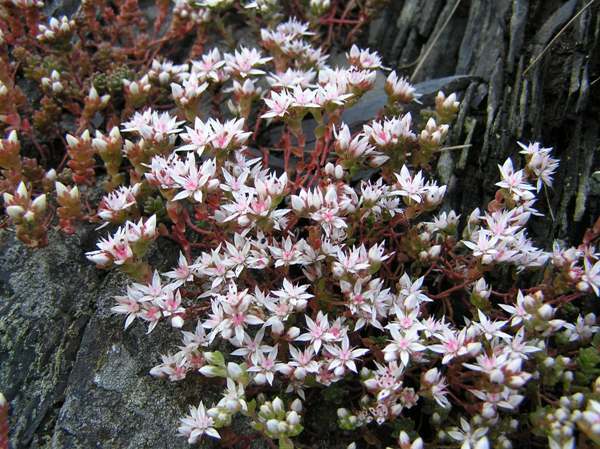 Sedum anglicum favours dry, rocky places such as old stone walls and quarries. This is also a plant of sandy acidic to neutral soils and very common beside well-trodden coastal footpaths, such as the Pembrokeshire Coast Path. English Stonecrop also thrives in sand dunes and sometimes in the shingle along shorelines, where you will also find its yellow relative Biting Stonecrop. In Britain and Ireland the flowers of English Stonecrop appear from June until late September. This colourful wildflower is now being used in 'green housing', where insulation is provided by plants that are allowed or actively encouraged to grow on the roofs. Not only do such roofs provide insulation against the extremes of winter cold and summer heat but they also improve the sound insulation. Sedum, the genus name, comes from the same Latin root a sedentary, meaning sitting down; it is a reference to the ground-hugging stature of stonecrops, including this one. The specific epithet is, as you would expect, a reference to the fact that this is a particularly common wildflower in England. Similar in size and general structure but with a taller growing habit and somewhat larger leaves than English Stonecrop, Biting Stonecrop has yellow flowers; it occurs inland more often than English Stonecrop does, but in coastal areas the two species are often to be seen in close proximity. 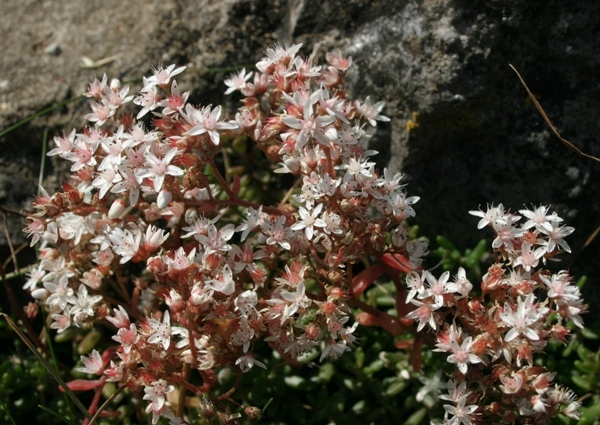 The pictures of Sedum anglicum shown on this page were taken on the Pembrokeshire Coast Path during July.